Domino's Pizza Enterprises Ltd (Domino's Pizza) is the largest pizza chain in Australia in terms of both network store numbers and network sales. It is also the largest franchisee for the Domino's Pizza brand in the world. Domino's Pizza holds the exclusive master franchise rights for the Domino's brand and network in Australia, New Zealand, France, Belgium, the Netherlands, the Principality of Monaco and Japan. The Domino's brand is owned by Domino's Pizza, Inc, a listed US company. 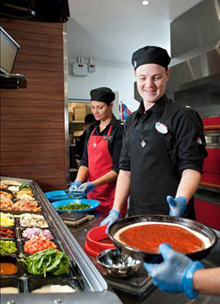 Domino's Pizza Enterprises now extend across six countries, with over 1,400 stores, employing approximately 26,000 and is the leading international Domino's franchisee. No other company is better placed to comment on the world of franchising than the number one pizza maker, Domino’s Pizza and they are looking for new passionate people to join their franchising team. Over the past few years, Domino’s has maintained steady growth while focusing on the operations of the business, improving all aspects of our product, service and image. 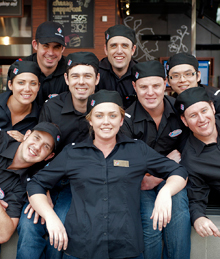 Domino’s Pizza strong growth plan across Australia means it is always on the lookout for passionate and motivated people to become franchisees. Many current Domino’s Pizza franchisees have found the job so rewarding that they now own several Domino’s Pizza stores. 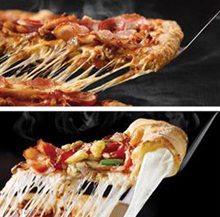 Domino’s Pizza (the franchisor) makes money out of selling pizzas, not franchisees. Domino’s whole focus is to help franchisees sell more pizza, make more money and, most importantly, have more fun. As you’d expect from the number one pizza company, the franchisee support systems are very highly developed at Domino’s. This support includes site selection, lease negotiation, store fit out, comprehensive pre-opening training, coordination of suppliers, group purchasing power, store appraisals, ongoing training and support, and marketing promotions. Domino’s offers franchisees professional and comprehensive training covering every aspect of store operations, infrastructure and marketing support as well as ongoing training and support and a dedicated store territory – and then there’s the security of a globally recognised and successful brand.